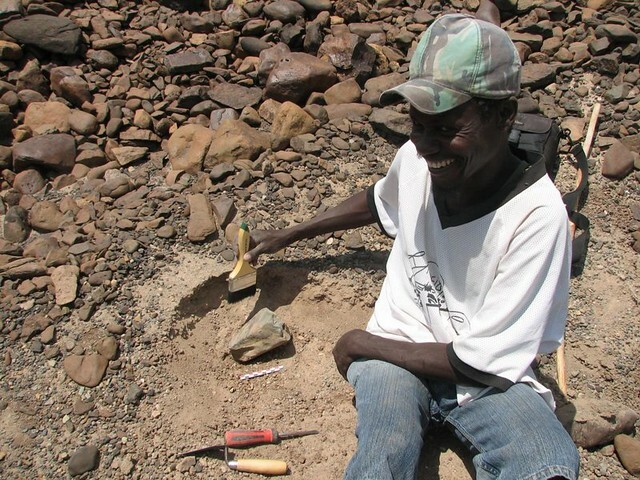 Earth Institute at Columbia University—Scientists working in the desert badlands of northwestern Kenya have found stone tools dating back 3.3 million years, long before the advent of modern humans, and by far the oldest such artifacts yet discovered. The tools, whose makers may or may not have been some sort of human ancestor, push the known date of such tools back by 700,000 years; they also may challenge the notion that our own most direct ancestors were the first to pound two rocks together to create a new technology. The tools "shed light on an unexpected and previously unknown period of hominin behavior and can tell us a lot about cognitive development in our ancestors that we can't understand from fossils alone," said lead author Sonia Harmand, of the Turkana Basin Institute at Stony Brook University and the Universite Paris Ouest Nanterre. Hominins are a group of species that includes modern humans, Homo sapiens, and our closest evolutionary ancestors. Anthropologists long thought that our relatives in the genus Homo—the line leading directly to Homo sapiens—were the first to craft such stone tools. But researchers have been uncovering tantalizing clues that some other, earlier species of hominin, distant cousins, if you will, might have figured it out. The Earth's magnetic field periodically reverses itself, and the chronology of those changes is well documented going back millions of years. "We essentially have a magnetic tape recorder that records the magnetic field ... the music of the [earth's] outer core," Kent said. By tracing the variations in the polarity of the samples, they dated the site to 3.33 million to 3.11 million years. 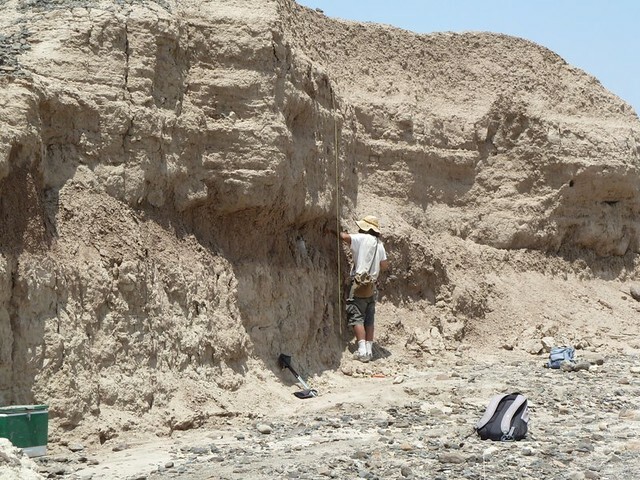 Lepre's wife and another co-author, Rhoda Quinn of Rutgers, studied carbon isotopes in the soil, which along with animal fossils at the site allowed researchers to reconstruct the area's vegetation. This led to another surprise: The area was at that time a partially wooded, shrubby environment. Conventional thinking has been that sophisticated tool-making came in response to a change in climate that led to the spread of broad savannah grasslands, and the consequent evolution of large groups of animals that could serve as a source of food for human ancestors. One line of thinking is that hominins started knapping—pounding one rock against another to make sharp-edged stones—so they could cut meat off of animal carcasses, said paper co-author Jason Lewis of the Turkana Basin Institute and Rutgers. But the size and markings of the newly discovered tools "suggest they were doing something different as well, especially if they were in a more wooded environment with access to various plant resources," Lewis said. The researchers think the tools could have been used for breaking open nuts or tubers, bashing open dead logs to get at insects inside, or maybe something not yet thought of. "The capabilities of our ancestors and the environmental forces leading to early stone technology are a great scientific mystery," said Richard Potts, director of the Human Origins Program at the Smithsonian's National Museum of Natural History, who was not involved in the research. The newly dated tools "begin to lift the veil on that mystery, at an earlier time than expected," he said. Potts said he had examined the stone tools during a visit to Kenya in February. "Researchers have thought there must be some way of flaking stone that preceded the simplest tools known until now," he said. "Harmand's team shows us just what this even simpler altering of rocks looked like before technology became a fundamental part of early human behavior." Ancient stone artifacts from East Africa were first uncovered at Olduvai Gorge in Tanzania in the mid-20th century, and those tools were later associated with fossil discoveries in the 1960s of the early human ancestor Homo habilis. That species has been dated to 2.1 million to 1.5 million years ago. Subsequent finds have pushed back the dates of humans' evolutionary ancestors, and of stone tools, raising questions about who first made that cognitive leap. The discovery of a partial lower jaw in the Afar region of Ethiopia, announced on March 4, pushes the fossil record for the genus Homo to 2.8 million years ago. Evidence from recent papers, the authors note, suggests that there is anatomical evidence that Homo had evolved into several distinct lines by 2 million years ago. There is some evidence of more primitive tool use going back even before the new find. In 2009, researchers at Dikika, Ethiopia, dug up 3.39 million-year-old animal bones marked with slashes and other cut marks, evidence that someone used stones to trim flesh from bone and perhaps crush bones to get at the marrow inside. That is the earliest evidence of meat and marrow consumption by hominins. No tools were found at the site, so it's unclear whether the marks were made with crafted tools or simply sharp-edged stones. The only hominin fossil remains in the area dating to that time are from Australopithecus afarensis. The new find came about almost by accident: Harmand and Lewis said that on the morning of July 9, 2011, they had wandered off on the wrong path, and climbed a hill to scout a fresh route back to their intended track. They wrote that they "could feel that something was special about this particular place." They fanned out and surveyed a nearby patch of craggy outcrops. "By teatime," they wrote, "local Turkana tribesman Sammy Lokorodi had helped [us] spot what [we] had come searching for." By the end of the 2012 field season, excavations at the site, named Lomekwi 3, had uncovered 149 stone artifacts tied to tool-making, from stone cores and flakes to rocks used for hammering and others possibly used as anvils to strike on. The researchers tried knapping stones themselves to better understand how the tools they found might have been made. They concluded that the techniques used "could represent a technological stage between a hypothetical pounding-oriented stone tool use by an earlier hominin and the flaking-oriented knapping behavior of [later] toolmakers." Chimpanzees and other primates are known to use a stone to hammer open nuts atop another stone. But using a stone for multiple purposes, and using one to crack apart another into a sharper tool, is more advanced behavior. The find also has implications for understanding the evolution of the human brain. The toolmaking required a level of hand motor control that suggests that changes in the brain and spinal tract needed for such activity could have occurred before 3.3 million years ago, the authors said. "This is a momentous and well-researched discovery," said paleoanthropologist Bernard Wood of George Washington University, who was not involved in the study. "I have seen some of these artifacts in the flesh, and I am convinced they were fashioned deliberately." Wood said he found it intriguing to see how different the tools are from so-called Oldowan stone tools, which up to now have been considered the oldest and most primitive. 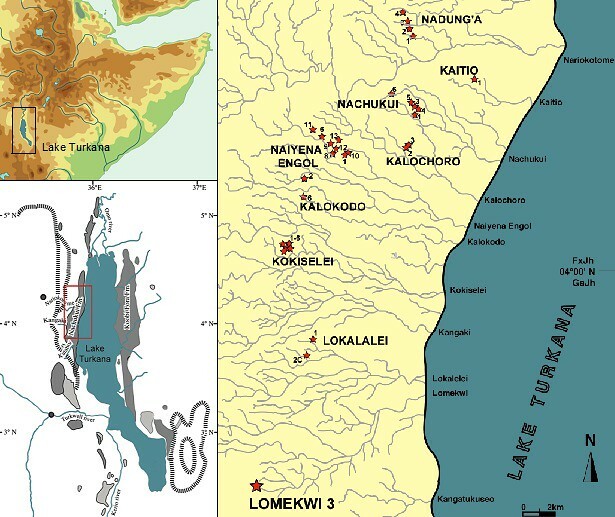 Lepre, who has been conducting fieldwork in eastern Africa for about 15 years, said he arrived at the dig site about a week after the discovery. The site is several hours' drive on rough roads from the nearest town, located in a hot, dry landscape he said is reminiscent of Arizona and New Mexico. Lepre collected chunks of sediment from a series of depths and brought them back to Lamont-Doherty for analysis. He and Kent used a bandsaw to trim the samples into sugar cube-size blocks and inserted them into a magnetometer, which measured the polarity of tiny grains of the minerals hematite and magnetite contained in the sediment. "The magnetics pretty much clinches that the age is something like 3.3 million years old," said Kent, who also is a professor at Rutgers. Earlier dating work by Lepre and Kent helped lead to another landmark paper in 2011: a study that suggested Homo erectus, another precursor to modern humans, was using more advanced tool-making methods 1.8 million years ago, at least 300,000 years earlier than previously thought. "I realized when you [figure out] these things, you don't solve anything, you just open up new questions," said Lepre. "I get excited, then realize there's a lot more work to do."